Local Law Enforcement Trade in Handcuffs for Aprons to Support our Athletes! If you're looking for a night out with the family or friends, head to Red Robin! 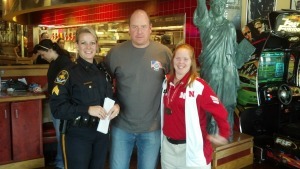 Nebraska law enforcement officers and department personnel will volunteer their time as “Celebrity Waiters” to collect tips at Red Robin Restaurants to support Special Olympics Nebraska. Join us at Red Robin on Saturday, October 12, 2013 from 11:00a.m. to 3:00p.m. and 4:00p.m. to 8:00p.m. The national goal of the 2013 Red Robin “Tip-A-Cop” event is to raise more than $750,000 from all participating national Torch Run programs to benefit Special Olympics Programs. Our program goal is $6,000. Special Olympics Nebraska provides year-round sports training and competition for children and adults with intellectual disabilities. By participating in sports, physical fitness and healthcare education programs, Special Olympics Nebraska athletes increase self-confidence and social skills, improve physical and motor skills, and have better success in leading more productive and independent lives. It is events like “Tip-A-Cop” that help us provide these programs at no cost to the athletes or their families.